I showed you how I organized my fabric stash and now I thought I’d show you how I organize my patterns and sewing books. Most of the patterns I make and choose to keep are for historic clothing. I choose to keep them so that I can use them as a reference for future garments or so I can reuse them as is. A lot of these are garments that I’ve made for myself, but some are also patterns I’ve made for work. Probably 85% of the patterns I keep are historic or vintage. And probably 90% of my patterns are self-made. (I really like having self-made patterns–I find it easier to see what’s going on when there is only one size on the pattern, no seam allowance included.) Some of the envelopes contain vintage and modern commercial patterns for which I’ve traced off my size for the given garment pieces, sometimes making changes to them as well. At that point, I choose to keep those pattern pieces separate from an original purchased pattern. Given these factors, I choose to organize my patterns by historic period. I use the post-it notes so I can easily change which folder the label is on. Purchased patterns (of which I only own very few) are stored separately, because there are so few of them. other pertinent information: such as the measurements the garment is made for, whether a mockup of the garment is also in the envelope, and an image or drawing of the garment if possible, etc. 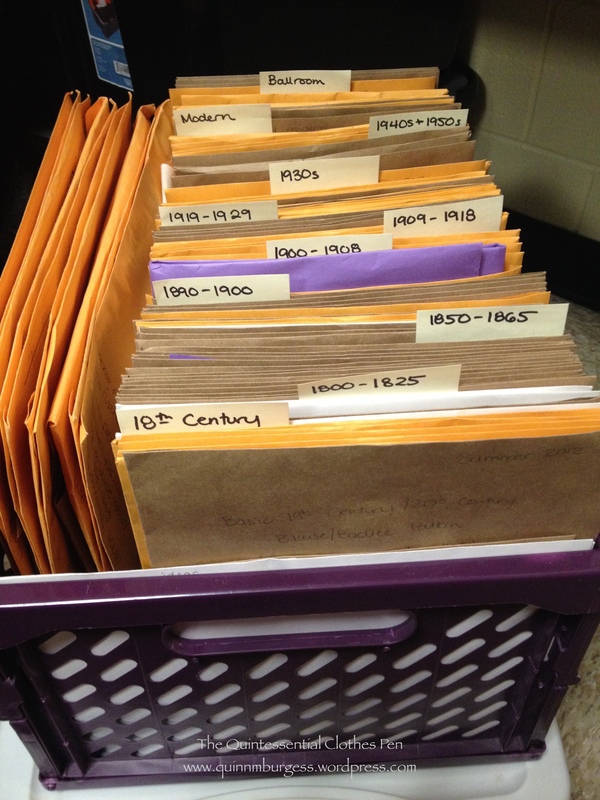 Each section is also organized chronologically. At this point, I’ve maxed out the number of patterns I can fit in this one basket, so I’m trying to decide what categories of patterns can be stored somewhere else, and where that somewhere else is… Someday when I have a sewing room I hope to change these over to a filing cabinet. As for my books, I keep all of my personal books at home and bring them into work only on an as-needed basis. I do this for two reasons: first, that I’m very protective of all books that I own and want them to stay in the best condition possible; and second, that I enjoy seeing these books regularly. The books are organized by the type of information they contain, then chronologically, if possible. The binders peeking up from the bottom shelf on the left are all full of notes and samples and other construction-related information. The books on the bottom right are other things including a binder of cooking recipes, wedding research, knitting books, and my Janet Arnold books. 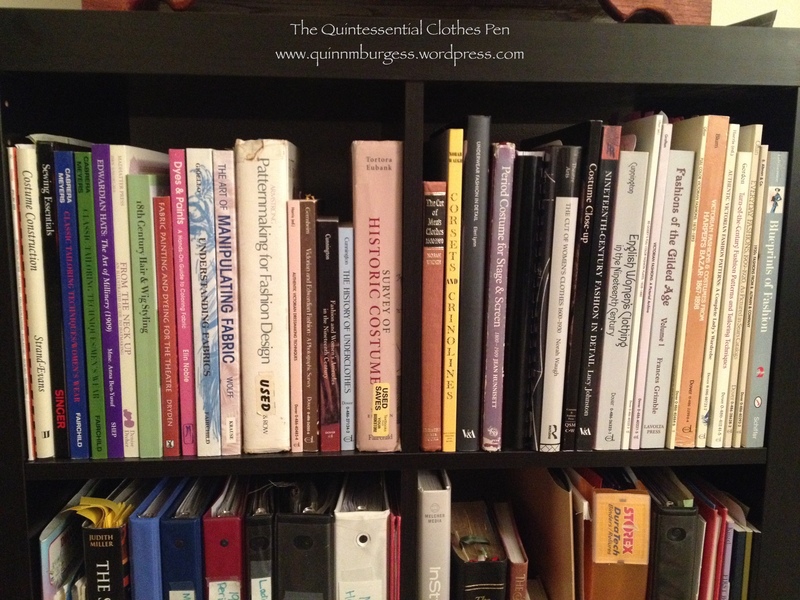 How do you organize your sewing related patterns and books? This entry was posted in Mockups, Patterning and tagged Books, Organization, Patterns. Bookmark the permalink. I have plastic tubs for the patterns, one for each genre, that are in the coat closet. My books are in the bookcase in the basement stored in sequential order according to era. Looks like you have a good plan. Oh yes, I have heard of other people using ikea boxes that fit those patterns perfectly. Nice! What a great idea to organize the patterns.